Turn Typing into an Adventure! TypeTastic: The Amazing Tool that Teaches Kindergartners to Type! Gone are the days when you could graduate without knowing how to type! Today’s students are constantly being asked to type reports and essays in school. The question then becomes, when should students learn to type? As a kindergarten teacher, my answer to this question is “as early as possible!” While some people may think keyboarding is too advanced for children of this age, my students have proven again and again that they are more than up to the task. Continue reading TypeTastic: The Amazing Tool that Teaches Kindergartners to Type! Teachers Share Why They Love TypeTastic! Educators around the world are excited about TypeTastic, and are finding creative ways to include it into all sorts of lessons with lots of different students—and they are sharing their experiences on their blogs! So, if you’re an educator wondering whether TypeTastic will work in your classroom, then check out these amazing recommendations from a trio of teacher bloggers who absolutely love TypeTastic! Continue reading Teachers Share Why They Love TypeTastic! Our mission is to bring TypeTastic available for everyone. That’s why TypeTastic.com is completely free with COPPA compliant ads. Kids can just go to the site and start practicing right away! However, we also know that many of you teachers would prefer to go ad-free and to serve the needs of our TypeTastic community better, we are now happy to announce our brand new Ad-free Edition for Schools. The Ad-free Edition has all the 150+ levels available at TypeTastic.com, just without ads, and more games are already on the way. Ready for the most exciting part? Teachers can now sign up to use the Ad-free Edition for free! Totally, completely free, there’s no catch. This Ad-free Edition is just the first step on our journey to eventually provide a full featured School Edition with all the bells and whistles that the teachers are looking for. During the next 12 months, a set of major upgrades will take place as we will be rolling out a bunch of exciting, advanced features like logging in, customization, tracking, reporting, and a lot of new study materials. The opportunities to develop our School Edition are endless! That’s why we invite you, teachers, to participate in this exciting developing process. Give us feedback, let us know the features you’d like to see in it, and we’ll listen. We’ll set your students for success and provide them with life-long typing skills together. We’d love to hear your thoughts and ideas about all this, so let us know what you’d like to see in TypeTastic School Edition. Send us feedback by commenting this blog post, connect with us on Twitter or Facebook, or reach us at hello@typetastic.com. Playing TypeTastic games and moving up the levels is a lot of fun. In fact, it’s so exciting that the students don’t realize that they’re actually on a carefully crafted learning path where each step has a clear, pedagogical goal. Eventually, the path, consisting of multiple steps, leads to fluent typing. This post will focus on the first three games where kids learn how to map out the keyboard. Triple your typing speed by using just one finger. JKL is the purple block on the right. Start keyboarding by using a mouse or a touchscreen. Really? Yes! These are some of our new and different ideas to teach typing. Not to brag, but the results have been phenomenal. Want to learn more? Keep on reading then. Typing courses have traditionally jumped directly to all ten fingers in the game from the very beginning, and they essentially make you copy words and sentences until you memorize all the 30 alphabetical keys. That’s one way to do it, but it’s frustrating, and it takes an enormous effort to get going. We wanted to challenge this traditional thinking because there just has to be a better way to kickstart your typing. So we set ourselves on a mission to make kids love typing, and that journey took us into real classrooms, listening and watching teachers and kids while they were practicing to use keyboards. Here are just three (plus one) of the many, inspiring ideas we brought back from those classrooms and which our brand new TypeTastic typing games are built on. While in the classrooms, we immediately noticed that kids’ shorter fingers, developing motor skills, and narrow eye-span made it hard for them to use multiple fingers for typing. We realized that it would be much easier first to take on the keyboard with just one finger. So we created beginner exercises for one finger typing, and guess what happened? The kids caught on typing much easier and quickly moved on from hunt-and-peck to triple their typing speed – with just a single finger. How amazing is that? It gets even better. Now that the kids already knew their way around the keyboard, it was super easy to take the rest of the fingers along with our Keyboarding Kickstart course. During our observations, it also became clear that young kids see the keyboard differently from adults. To them, the keyboard is letters and characters in a random order, with no real logic to it. So we realized that instead of teaching almost 30 alphabetical keys individually, it would be a lot easier and faster if the letters were in logical groups. Take J for example – you remember seeing it somewhere but don’t quite remember where. But wait a minute! Didn’t J belong together with K and L? In that purple ‘JKL’ group located on the right side? There you go! So we came up with a unique TypeTastic keyboard visualization that splits all the letters together into nine, color-coded groups. It also doubles as a game board in many of our games. This enables the kids to see the keyboard like a map, and it will be much easier and more fun to find their way around. Third big idea: Make it FUN! The third observation was that whenever the students got to practice typing by playing a game, their motivation shot through the roof. Even the kids sitting next to them were curious to see what was going on. So to maximize motivation and accelerate learning, gaming was an obvious way to go. And it works. Kids immediately build a positive, rewarding, and encouraging relationship for typing through playing games. To smooth the path, we even made the first introductory games playable with a mouse or touch screen gestures! Overall, game-based, colorful, and cute approach keeps students engaged and interested for surprisingly long periods, and their learning is unbelievably fast. As a result, the kids’ typing speed improves tremendously in a just few, short hours of practicing. On top of that, there’s no installing, updating or plugs needed. You’ll just sit back and enjoy the smiles on their faces when they practice, so it’s easier than ever before. You’ll be surprised! This is just the beginning of our game-changing approach, and in the upcoming posts, we’re going to discuss more typing adventure that you’re about to enter with us. Stay tuned! For Special Education Students, TypeTastic Leads to Keyboarding Success! 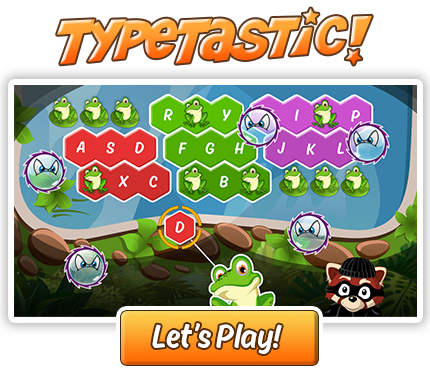 TypeTastic School Edition Brings Joy of Typing to All Grade Levels! Copyright 2019 Typing Master, Inc.